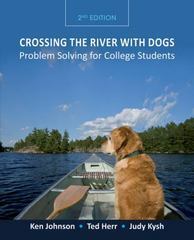 Crossing the River with Dogs 2 Edition Crossing the River with Dogs: Problem Solving for College Students has been adapted from the popular high school text to provide an accessible and coherent college-level course in mathematical problem solving for adults. Focusing entirely on problem solving and using issues relevant to college students for examples, the authors continue their approach of explaining classic as well as non-traditional strategies through dialogs among fictitious students. This text is appropriate for a problem solving, liberal arts mathematics, mathematics for elementary teachers, or developmental mathematics course.